I read this interesting piece on the value of Jonathan Toews to the Blackhawks powerplay this year, so I thought it was good enough to be on the blog. Take a read. Story by Puck Daddy’s Harrison Mooney. The Chicago Blackhawks currently sit atop the NHL with 27 points. They’ve been excellent in nearly every area through the first quarter of the 2011-12 season. But, if there’s been a concern thus far, it’s been the inconsistency and, at times, the downright absence of their powerplay. This was no more apparent than two weeks ago, when the Blackhawks suffered an embarrassing home ice loss to their rival Vancouver Canucks, largely due to losing the special teams battle: the Canucks scored 5 powerplay goals in 6 tries. The Blackhawks went 0-for-5. Since then, however, the powerplay has begun to turn around. After scoring only 5 times in 53 man advantages through the season’s first 14 games — worse than all other NHL teams except the St. Louis Blues and the Columbus Blue Jackets — the Blackhawks are 7 for their last 22. It’s not surprising. It was really only a matter of time before that group began to click, especially when you consider that, with Jonathan Toews on the ice, they start with the puck nearly 3/4 of the time. This is nuts, by the way. Toews’s faceoff prowess is well-known, but when it comes to 5-on-4 situations, you wonder if the opposition’s fifth guy was supposed to take the draw. 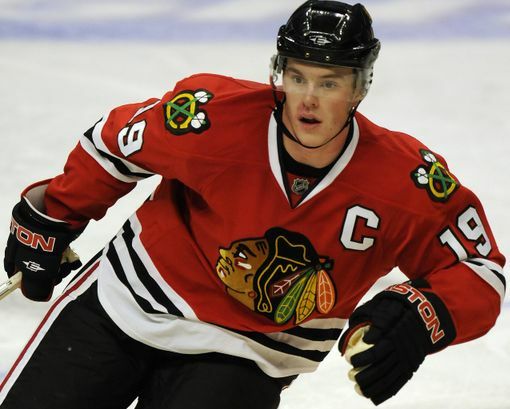 Toews has always been a been a handful in the circle. In his rookie season in 2007-08, he won 53.2% of his faceoffs, good for 23rd in the NHL, and he’s finished no lower than 11th in the three seasons since. This year, Toews has reached another level entirely. His current 61.6% win rate is well above his career-best. It’s also the second-best percentage in the league, and not by much — David Steckel leads the category at 61.7%. As of this writing, only six NHL centres have won over 40 powerplay faceoffs: Eric Staal, Mikko Koivu, Jason Spezza, Paul Statsny, Vincent Lecavalier, and Toews. But Toews hasn’t simply won 40 — he’s won nearly 40 more than he’s lost. With the man advantage, Toews is 62-for-85 in the faceoff circle, good for an obscene win percentage of 72.9. On the powerplay, Jonathan Toews starts with the puck. Considering that a lost faceoff can trim as much as 45 seconds off a two-minute man advantage, this is incredibly helpful. Expect the Blackhawks’ powerplay to continue to improve, especially considering how often Jonathan Toews lets them practice.